Label owner Darin Epsilon presents his first ever mini-album for the 37th release on Perspectives. 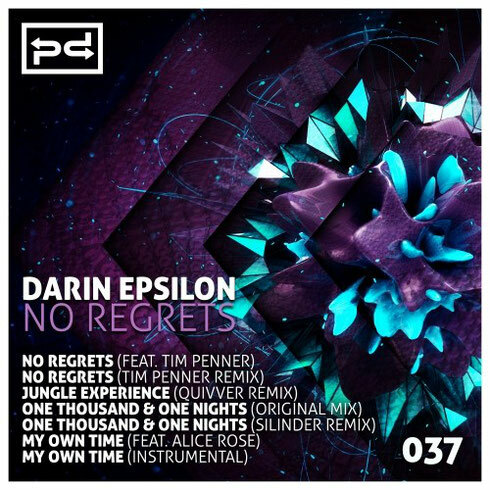 ‘No Regrets’ is a collection of new original tracks, remixes and collaborations with a cast that includes John Graham aka Quivver, Silinder, Tim Penner, and Alice Rose. 2015 will go down as one of Darren’s biggest, after a series of releases on Sudbeat, Perfecto, and Selador. Over the summer he signed with the Nightlaw Agency and launched an official Beatport Play remix contest. He had several important tour stops along the way, such as Ministry of Sound London, Amsterdam Dance Event, Exchange LA and South by Southwest in Texas. Canadian born Tim Penner's decade-long experience working in the electronic music industry has given him his own unique perspective, with a style that blends influences from techno, house, and trance. His work has been apparently championed by Hernan Cattaneo, Nick Warren, Above & Beyond and Guy J, among many others. Recently he’s been making noise with his remixes of Max Graham and John 00 Fleming. Here he collaborates with Darin on ‘No Regrets’. UK producer John Graham aka Quivver started his career in the early-990s and has possibly been a household name within the electronic music scene ever since. John has gained support from DJs and close friends such as Sasha, John Digweed, Pete Tong and Paul Oakenfold. He makes his Perspectives debut with a remix of Darin’s ‘Jungle Experience’. Dublin based Silinder aka Gavin Mulhall has been producing electronic music for over 14 years now. His discography includes releases on labels such as Sudbeat, Balance and Renaissance. He makes his fourth appearance on Perspectives with a deep, dark, and hypnotic remix of Darin Epsilon’s 'One Thousand & One Nights'. Hailing from Denmark, Alice Rose is a vocalist and instrumentalist who has intrigued audiences with her distinct live performances. Her electro-acoustic shows include everything from drum computers to Casios to effect machines spread out across the table. Alice also plays the viola with her own bowing style and sings her lyrics with a voice that spans a wide register, from the sweet angelic to the hard and wild. The Danish singer makes her label debut here on 'My Own Time'. Check it out below, it’s out 16 November.